Have you ever dreamed you were hiking among the clouds in a far away, exotic land? 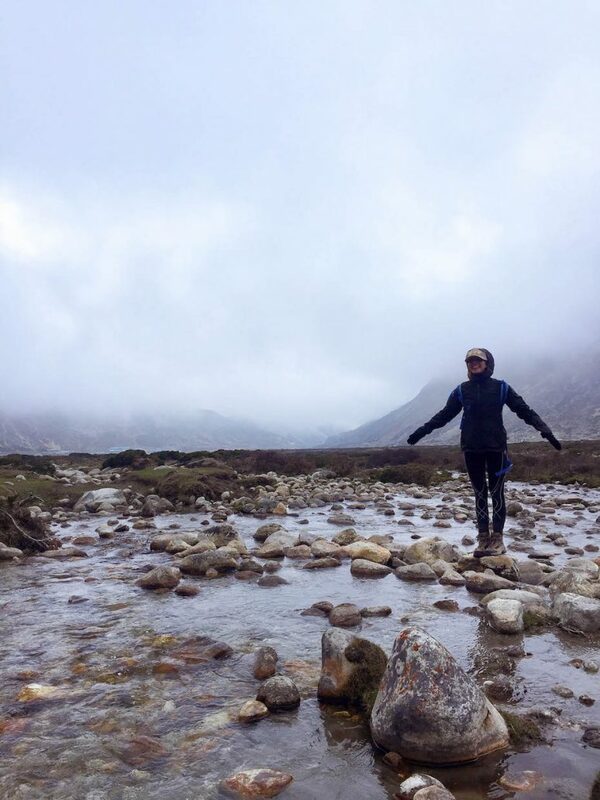 Exploring a culture vastly different from your own while testing your personal boundaries and pushing the limits of your mental and physical strength? 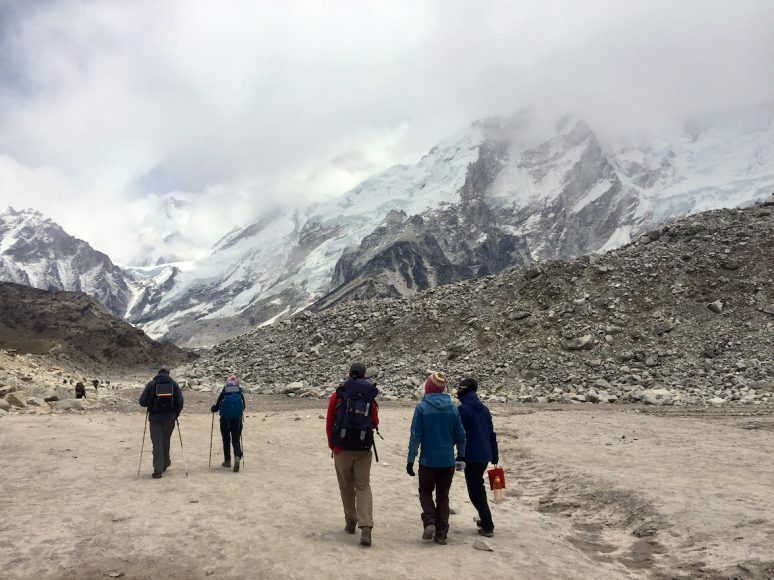 A journey like a trek to Mount Everest Base Camp will certainly accomplish all this, allowing you to discover new depths within yourself and changing the way you see the world. It’s for these reasons, and so many more, that the world’s most revered mountain held a very high spot on my bucket list. I just never imagined I would be fortunate enough, and quite frankly ballsy enough, to cross it from that list whilst still in my 20s. Post my trip, as I relax in the air-conditioning, my belly full of delicious fresh fruit and chai tea, I want you to know that it’s a very realistic and achievable goal. 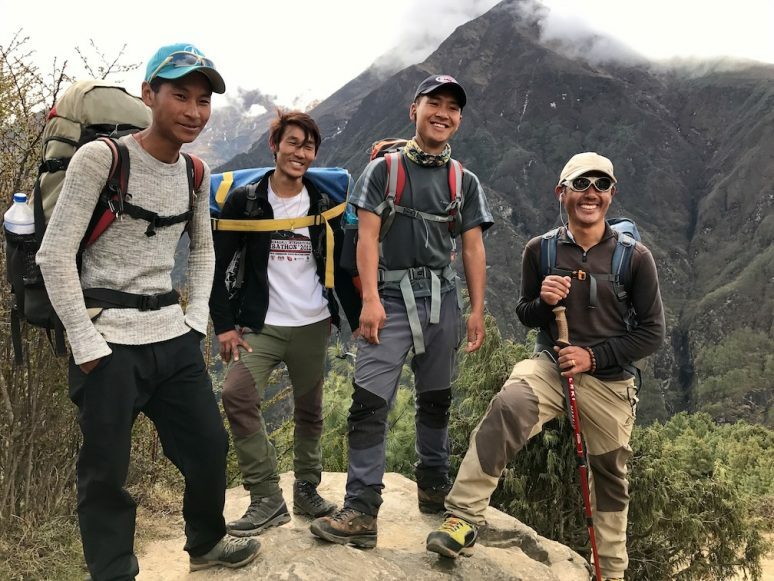 Here are five of the most significant reasons I encourage you to take the plunge and plan your Everest Base Camp trip. Because even as I sit here comfortably, the magic of the mountain still calls to me, tempting… can you go even higher? While there are absolutely some very real dangers to consider, there are also countless resources, blogs, articles and more, to help you prepare. To put it simply, Everest is stunning. 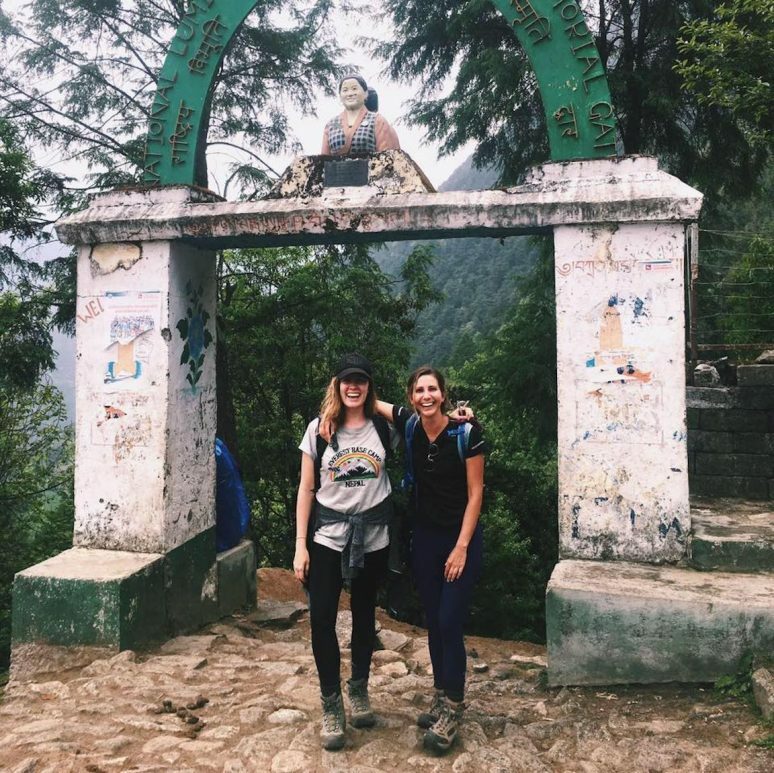 Whether you choose to begin your journey in Nepal or Tibet, you will never forget the views as you wind your way through the massive Himalayan Mountain Range. Honestly, the list of unforgettable sights along the trail is worthy of a blog post of their own… oh wait, there are already tons available for you to peruse! Experience hiking along steep cliffs and marvel at the line where the trees uniformly end. It’s as if they all decide at once, “NOPE, not going an inch further.” Don’t be surprised if you too have this thought along the way, but trust me, you will ultimately want to keep going and be thankful that you did. 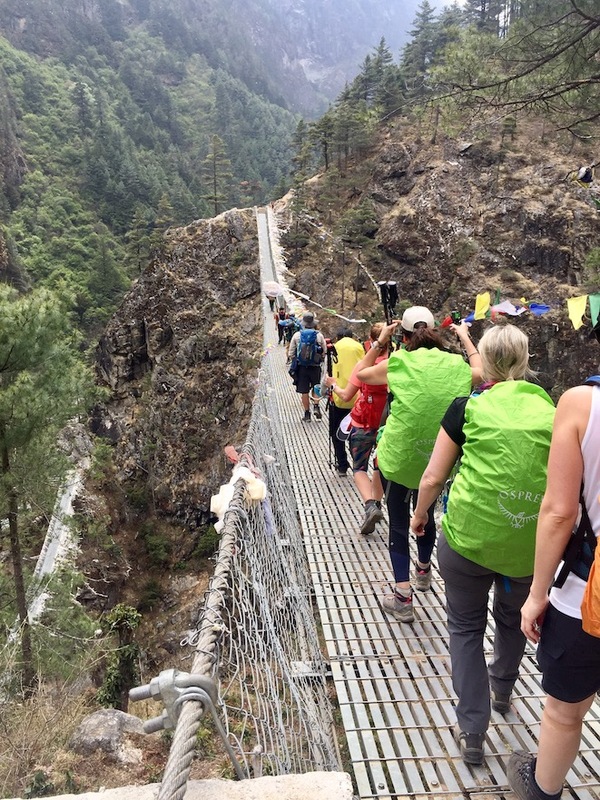 You quickly become accustomed to the daily trail routine of shuffling to the side of the path (the mountain side of course, not the cliff side!) 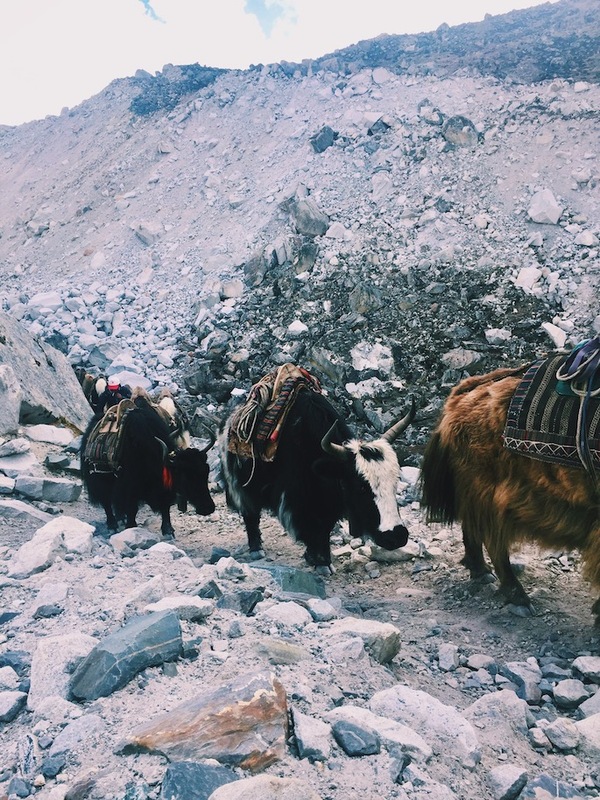 as single file lines of yaks and donkeys weighed down with supplies push past. As you ascend higher and higher, you will follow along with the Dudh Kosi, a river so light blue it’s almost a shade you’ve never seen. The harsh landscape commands your utmost respect, boasting truly ominous valleys of ice hidden under heavy layers of fog. 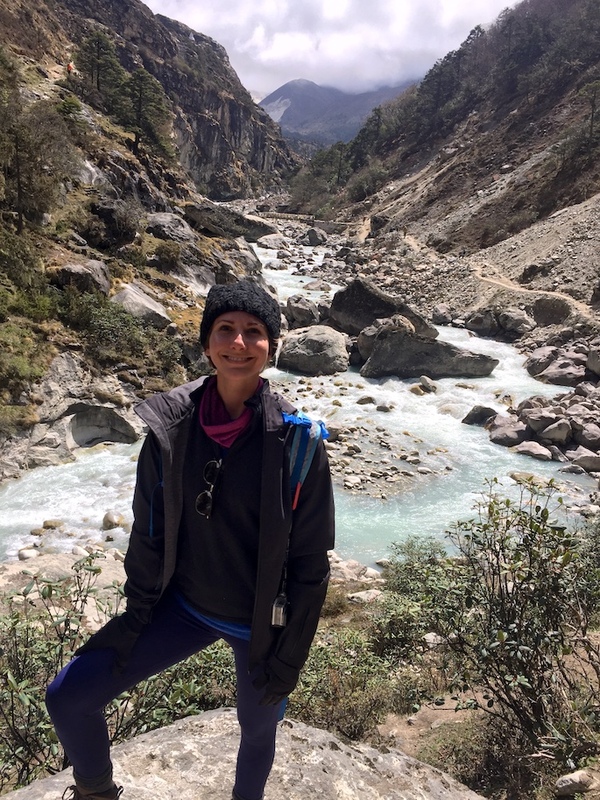 As you hike, you’ll soak in the perfectly preserved culture of the Nepalese people, and likely learn a great deal from them. Life is much more simple in this severe land, material things matter less as basic necessities like rice and water render everything else trivial. 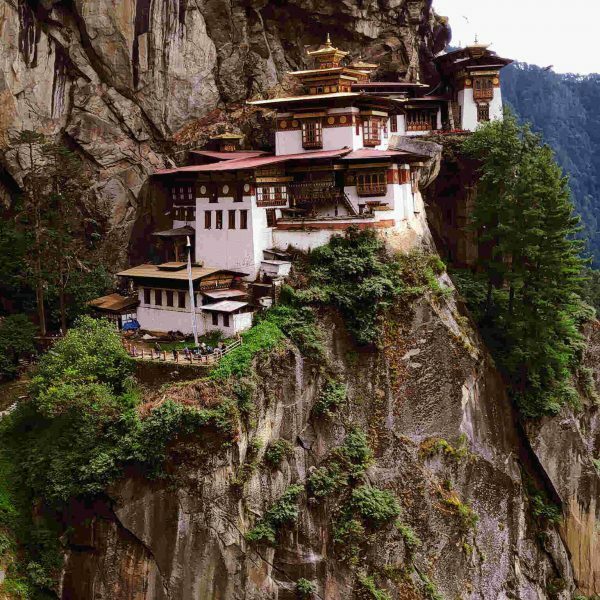 Stroll through small villages on cobblestone paths as you pass mothers washing clothes and bathing infants in the yard, domesticated yaks grazing peacefully nearby. 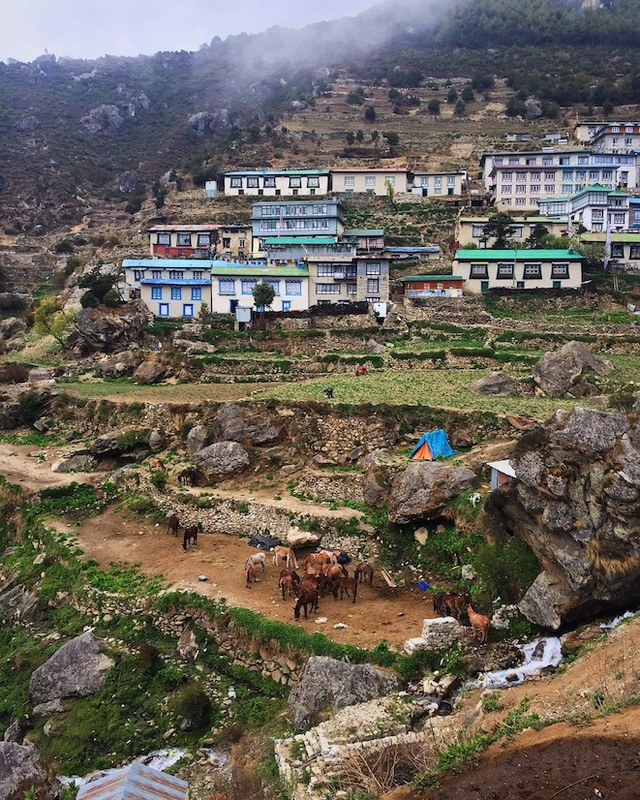 Stop in the Namche Bazaar, the mountain’s most bustling town, and enjoy an afternoon of Everest luxury. Pizza shops, cake shops, clothing stores, and jewelry stands line the streets. You will visit ancient temples where monks pray to their Gods and run your hands along intricately carved sacred bells for good luck. Their brightly colored paint has chipped away over the centuries in a beautiful rustic fashion. 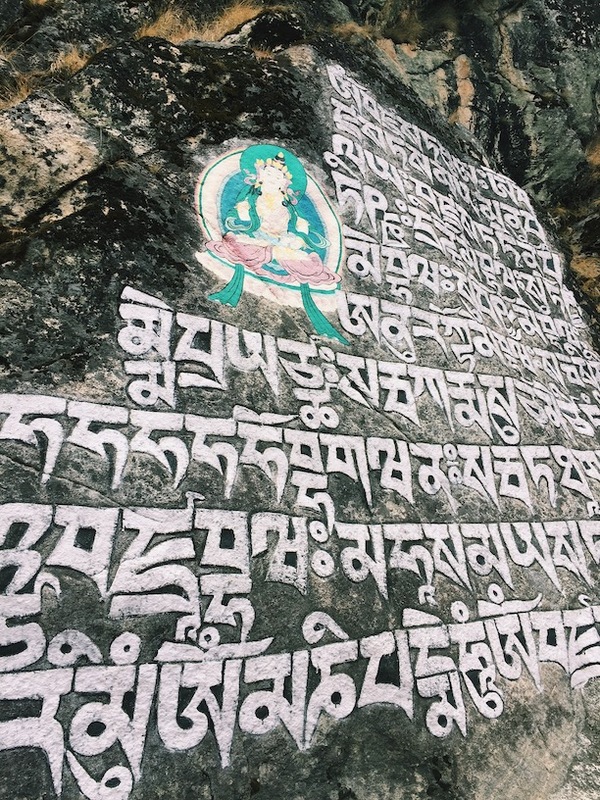 You’ll respectfully walk to the right of each mound of prayer stone and step to the side of the trail when local Porters walk past. While we might view their daily living as a struggle, you’ll see only smiling, pleasant faces and the most adorable children will make the peace sign with their tiny fingers and exclaim “Hi!” over and over. 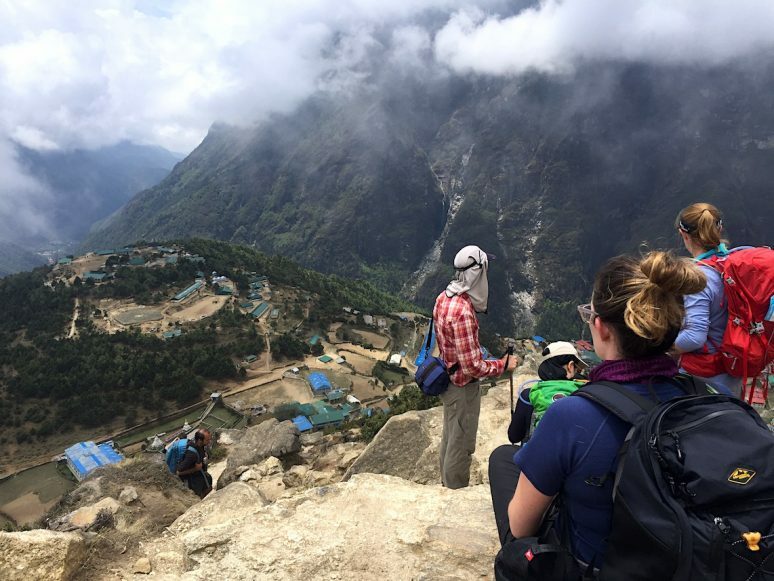 Lastly, watch in awe as the Nepalese people hike up to your day’s end destination and back down just to do the journey with you again as you huff to complete that same trip only once. Your guides will jump from rock to rock, carrying 100lb packs with an ease and grace you didn’t even know was possible. If you begin the journey solo, or with 30 strangers like I did, you’re sure to end having met the most amazing people and create special bonds over the countless wonderful and trying moments. 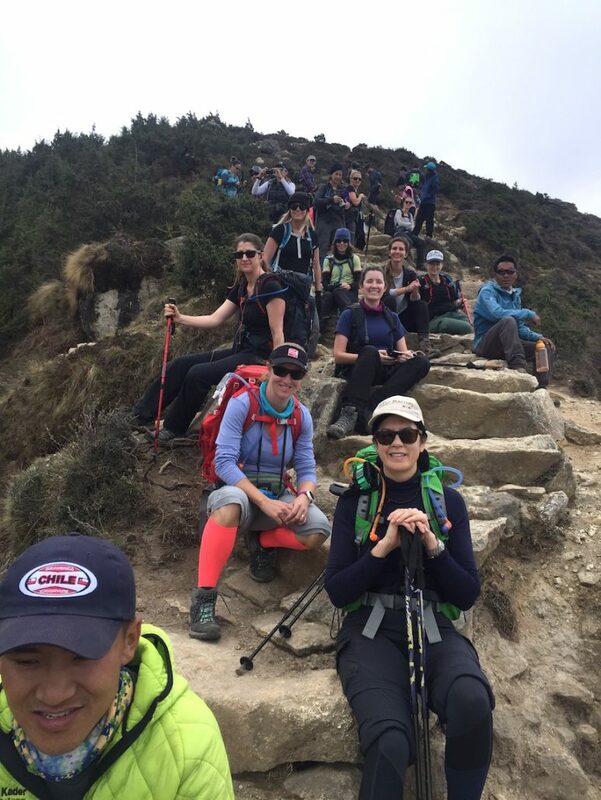 My trekking group consisted of 27 females and 3 males all having fundraised for a non-profit prior to the trip (details available below!). 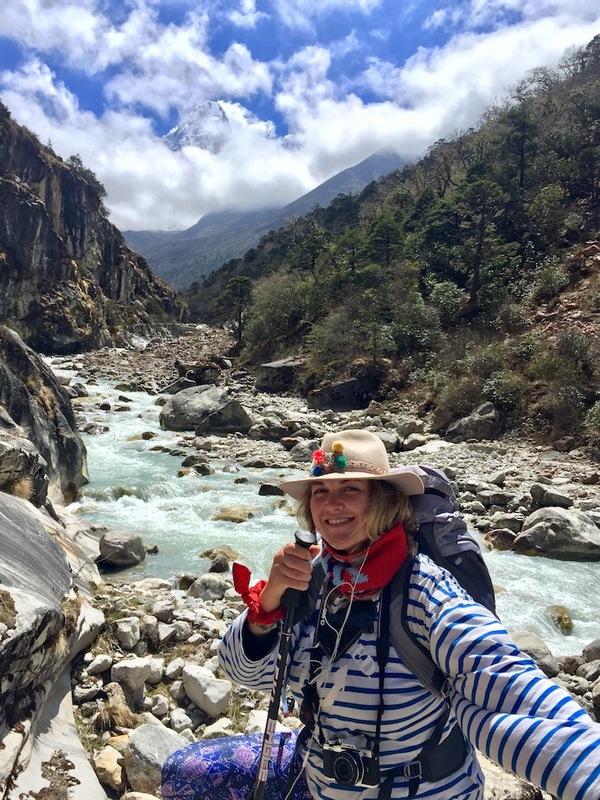 We were accompanied by five Sherpas, two Doctors, the Porters and one badass leader, Kinga, who volunteers her time traveling the world and leading similar expeditions (not a bad gig!). Among my hiking companions was the charming Cami, who founded a charity supporting burn victims in South Africa. There was Urgen, a burn victim herself, having suffered severe injuries after an unfortunate kitchen grease accident. Her sweet demeanor and quiet determination remains an inspiration to us all. There was my awesome roomie, Harri, who probably saved my life on multiple occasions. And then there was Skye… the girl who hiked to Base Camp wearing fabulous psychedelic tights and a bright red Mickey Mouse sweatshirt. These wonderful people, and so many more holds such a special place within my heart. 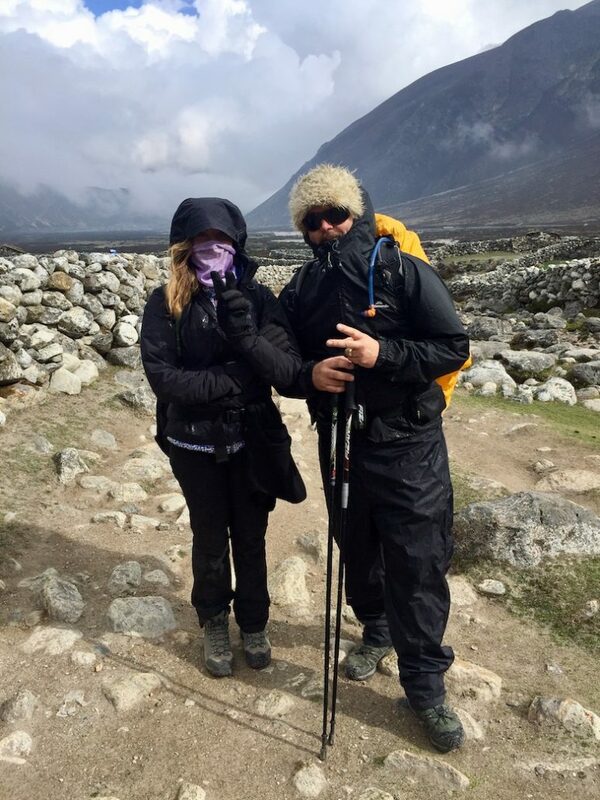 Outside of my group there were also some memorable encounters as well, including the chatty girl trekking Everest on her own (I actually wouldn’t recommend this – at least hire a private guide). 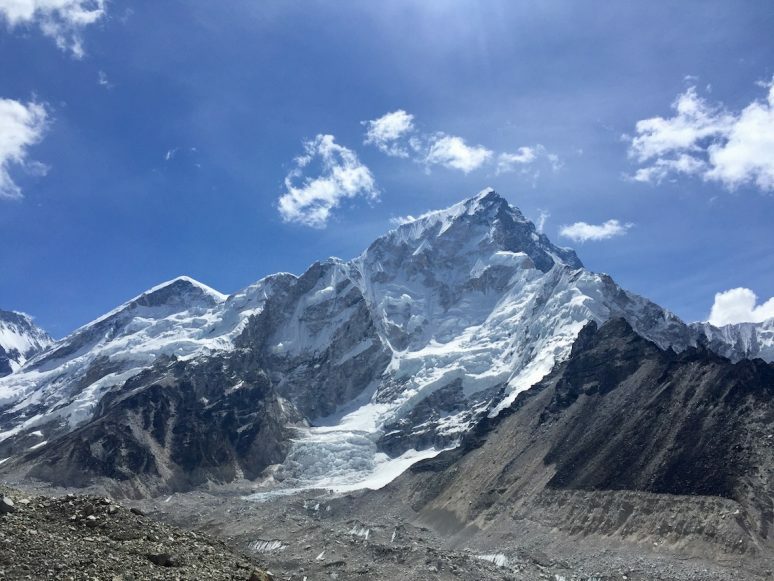 We met an awesome nine-year old and Dad duo the day we reached Base Camp. Apparently, it was their 3rd time at Base Camp being their regular spring break tradition (are you freaking kidding me!?). 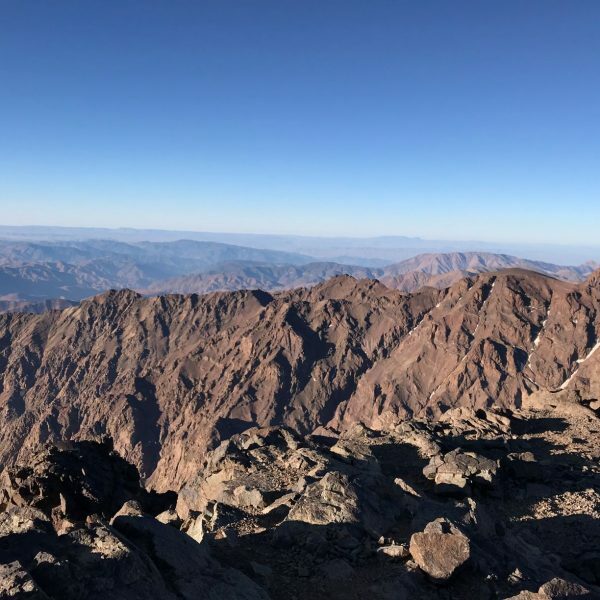 We got to connect with a group of friendly old-timers who were attempting to summit and told us their plans as my companions and I sipped cups of hot chocolate in one of the lodges. Later we rejoiced upon hearing they did indeed reach the Everest Summit. Helen Keller once said, “life should be a daring adventure or nothing at all.” Now, let me start by saying that “daring” is a relative term. Some consider jumping from a plane child’s play, while others would consider staying out past 9 PM as daring. And, let’s be real, we can all relate to this last one sometimes (who can resist Netflix and chill?). If you’re anything like me, however, you LOVE to challenge yourself, and if you’re going to challenge yourself, might as well go big or home. Tackling the world’s highest mountain is obviously at the top of the daring and challenge yourself list, and rightfully so. Freezing cold nights, dangerous rocky terrain, steep cliffs, potential avalanches, limited food, and water, need I say more? 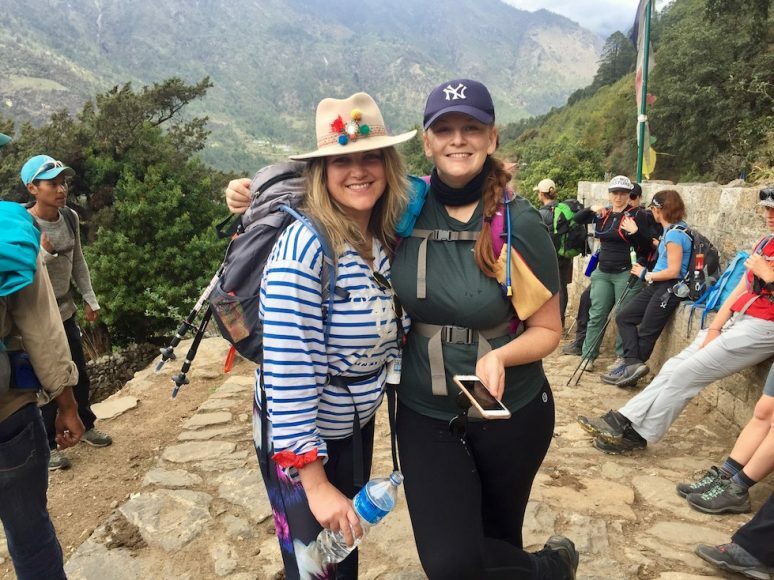 It’s a lofty adventure, but one that’s sure to change your life forever, which is why nearly 30,000 individuals complete the revered trek each year. Throughout the trip, my companions and I each experienced our own struggles. From altitude sickness, extreme fatigue, attempting to sleep in temperatures under 20 degrees, and even episodes of dysentery, many of us considered turning back preemptively. It was on our final day of hiking, in the early morning darkness, all of this was forgotten and a feeling of complete triumph rushed over us. We could see clearly in the distance across the valley, the headlamps of fellow hikers brightly shimmer as they reached Everest’s summit. It was a truly humbling moment and worth every trial. During what would surely be one of your life’s most epic adventures, you will become familiar with the tranquility of leaving all your daily stressors behind. Prior worries, fears, doubts, and disappointments quickly melt away when your sole focus becomes the now daunting task of putting one foot in front of the other day after day. On top of the world, all that matters is making sure you get a good night’s rest, have plenty food and water for the next day, and your body feels well enough to keep pushing on. The stillness of mind is truly a liberating feeling and allows you to fully experience the present moment, connecting with yourself and your surrounding. 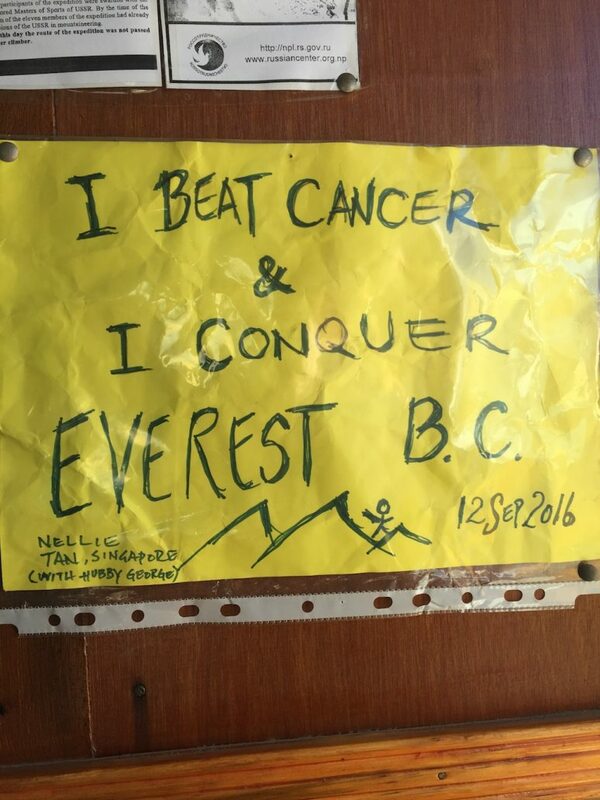 One of my favorite and most vivid memories remains sitting in one of the many tea houses and noticing a bright yellow sign on the wall stating, “I conquered breast cancer and Everest Base Camp.” My eyes instantly watered, who was this incredible woman and how I would love to have met her. It was such a profoundly human moment. Whoever she is, she will never know how much love and I respect her for her journey. Luckily, the Everest adventure does not abruptly end upon reaching the windblown, barren rock train with a few yellow tents that are Base Camp. The descent down the mountain still takes a few days and gives you one last chance to revel in all you’ve accomplished. The amazing high feeling is due both to your inner reflection and the actual increase in oxygen now coursing through your body. To this day it remains one of the most fulfilling, downright fun accomplishments of my life, and inspires me to continue chasing that which pushes me to grow. 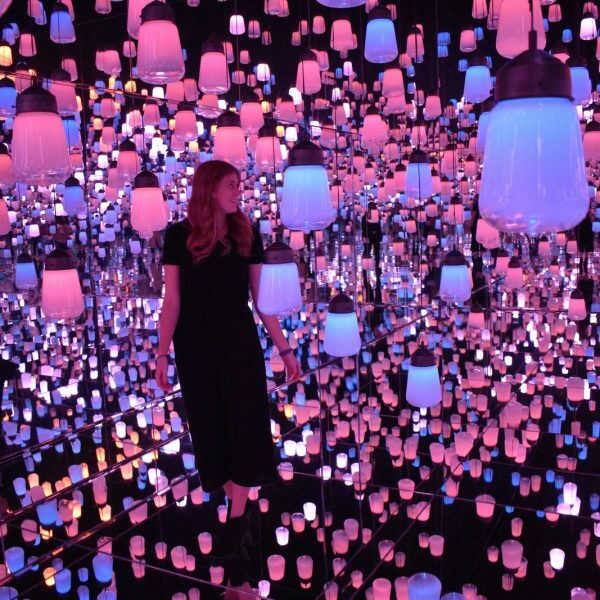 My simple hope is to have sparked something within you that encourages you to revisit your dreams and entices you to make them a reality, not later, but now. Each of us has the power to shape our realities, make a positive impact on this world and pursue what we love. 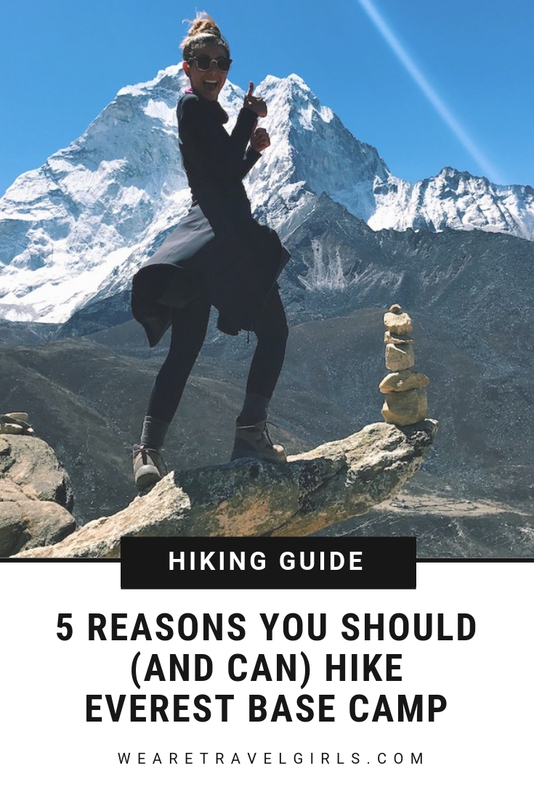 Have you ever been hiking? If you have any additional tips for our readers or questions please leave these in the comments below. Awesome read! You’re an inspiration and talented in so many ways. Here’s to many more adventures!